HEMP OIL ~VS~ CANNABIS (WEED) OIL, WHAT’S THE DIFFERENCE? Personally I’ve been wanting to get my hands on some cannabis oil for it’s healing powers of all sorts of diseases from minor to as major as all kinds of cancer but because I live in the state of Connecticut I am unable to. 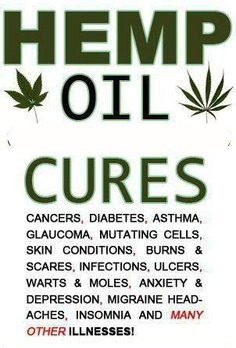 Therefore I am very delighted to have discovered it’s cousin, hemp oil called CBD oil. What’s the difference you ask considering it’s the same plant? Let me explain…. Medical cannabis derived from marijuana is the female flowering plants that yield budding and contain high levels of THC credited to causing the marijuana high. Medical marijuana produces anywhere between 5-20% THC on average where hemp contains very little, in Canada they set the maximum at 3%. Achieving maximum THC levels in marijuana is tricky and requires close attention to grow-room conditions. Marijuana growers usually aim to maintain stable light, temperature, humidity, CO2 and oxygen levels, among other things. In contrast, hemp plants are primarily male, without representing flowering buds at any stage in their life cycle. On the other hand, hemp is usually grown outdoors to maximize its size and yield and less attention is paid to individual plants. They grow tall and sturdy and often used for other materials like clothing and paper. Hemp and marijuana plants contain another important cannabinoid: CBD. Hemp plants produce more CBD than THC, while marijuana produces more THC than CBD. Interestingly, research has shown that CBD acts to reduce the psychoactive effects of THC, separating hemp further from marijuana. As you might already know, all cannabis is illegal to produce in the United States. Both hemp and marijuana are classified as Schedule I drugs under the Controlled Substances Act. However, outside the U.S., hemp is grown in more than 30 countries. In 2011, the top hemp-producing country was China, followed by Chile and the European Union. Hemp production is also expanding in Canada, with the country’s annual crop reaching a record high of 66,700 acres in 2013. MUST WATCH VIDEO: Wisconsin Family Explores Healing From Hemp Oil- INCREDIBLE! Now with all that said,…. Personally I am looking into what their wholesale requirements are!! Enjoy~ Be happy, be healthy! Categories: cannabis, Hemp oil, Uncategorized | Tags: cannabis, Hemp oil | Permalink. Thank you Kathryn, I love CBD and am constantly advocating and educating people about it. We live in exciting times, knowledge empowers and lifts the veil that was placed over the cannabis plants.. Hemp CBD gives you the health without the high, the hemp plant itself can be used in a million ways, hemp can heal not only health and mind but also economies and the planet! I encourage you to checkout my website on CBD facts and my personal product recommendations (what I use) at http://www.HempOilFacts.com, if you need wholesale pricing contact me I can arrange for that. Gift cards for new customers are also available. Thank you, I will check that out sometime.